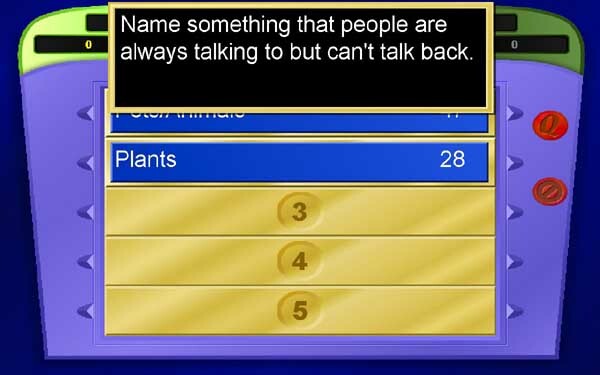 You’ve watched Jeopardy and other game shows for years. Often times, viewers of these shows say to themselves "these questions are easy, I should be on that show"! Well, step up to the plate, because the DJ Connection has just the thing you have been waiting for! 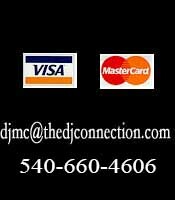 The DJ Connection's Game Show can be used for two main purposes: Fun & Entertainment - Training & Education. Lets take a look at these options for using The DJ Connection's Game Show! When used for fun and entertainment, questions are asked about TV & movie trivia, music, sports etc. 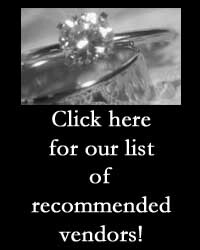 Questions can also be tailored to any type of event - birthday party, Bar/Bat Mitzvah - even a wedding reception or rehearsal dinner. 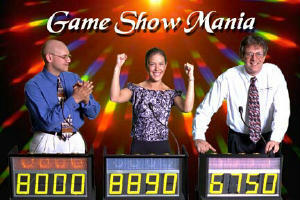 Game Shows are often incorporated during cocktail hours at corporate banquets or holiday parties and can electrify your event! In addition to the traditional "Jeopardy" style format pictured above, we also offer Family Feud style game shows, using state of the art software and video projection system. 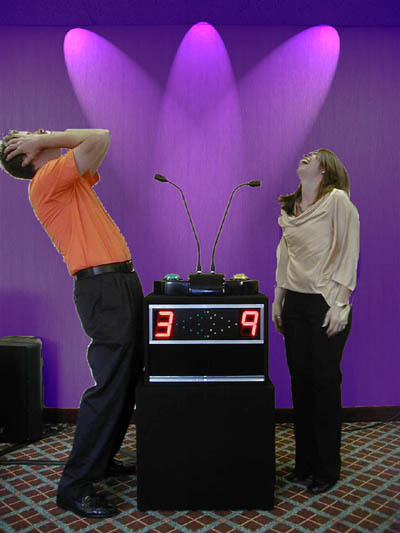 The Family Feud system also includes a "Face-Off" style podium, similar to the one seen on the TV Game Show Family Feud. Studies prove that we best retain what we have learned when we are engaged in the learning process. Say goodbye to boring training meetings where your staff is fighting to stay awake. 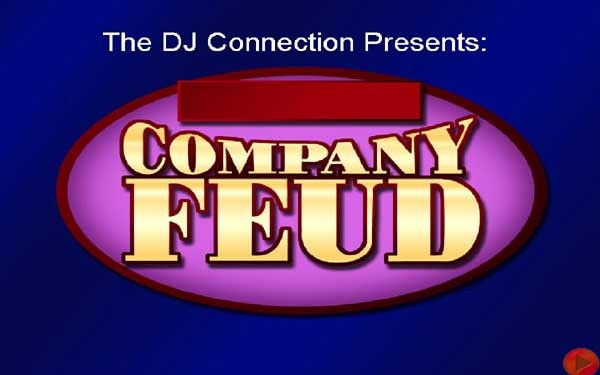 The DJ Connection's Game Show will inspire your employees to stay attentive, retain what they've learned, and spark the spirit of competition. Training meetings will be something that employees actually look forward to, and that will go a long way in fostering good company morale. Here’s how it works. You or your designee can write trivia questions based on relevant job performance standards and tasks. Questions can come from a variety of sources – employee policies or manuals, technical questions about the products or services you sell, questions regarding proper safety procedures, etc. Your employees use the Game Show system to answer the questions you have provided us in advance. We can ask your employees questions that you provide, or mix in other fun trivia questions to liven things up – the choice is yours. 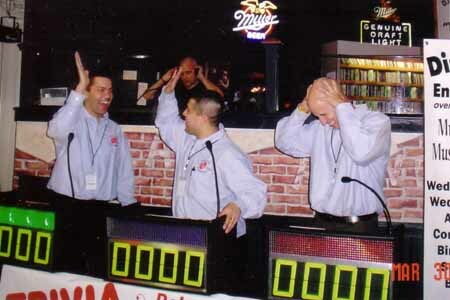 We have extensive experience in producing game show training sessions, and work with your company to create a fun training experience for your employees! Call our game show customer service specialist today to learn more about our game show services for corporate training and/or entertainment purposes!